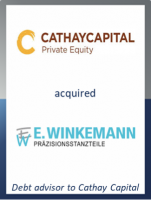 Dr. Bernd Sent, Managing Director of E. Winkemann, stated: "We have chosen Cathay Capital as a new partner in our capital structure to help us with our ambitious international expansion strategy and the extension of our production site in Plettenberg. Our common ambition is to grow from the solid positioning we have built in Germany and Europe to a new stage of expansion on a global level." Andreas Holtschneider, Partner for DACH at Cathay Capital, added: "Cathay Capital’s teams are delighted to have been chosen by E. Winkemann’s management team and Equistone to support the company’s development beyond its current borders. Thanks to our unique ecosystem, E. Winkemann will benefit from our proven experience in partnering with companies looking to enhance their international dimension." Thorsten Weber, Director at GCA Altium, commented: "We are convinced that Cathay Capital is the ideal partner for E. Winkemann. Together with the company’s strong management team, Cathay Capital will lead the group into the next growth phase. The implemented financing structure fits perfectly with E. Winkemann’s strategy and represents an excellent basis for the group's future growth."